Standing on a hillside, this stunning, Mediterranean Jewel is the ultimate luxury getaway. From the villa, it is a pleasant 15-20 minute walk to the Town Centre. T2047 promises a breathtaking totally unobstructed sea-view from all floors, and if you are not enjoying it on the roof-terrace, you might feel inclined to take it all in through the wall-length, West-facing French windows of the living room. It is like the sea, but in panoramic wide-screen! Tastefully designed over three floors, the villa offers privacy in abundance and boasts a modern, minimalist decor, with bright, airy spaces and color-themed bedrooms. Outdoors the patio is furnished with all the paraphernalia you will require to while away lazy afternoons by the infinity pool. While the roof terrace is the ideal spot to catch the sunset over a languid, alfresco dinner. Double bedroom with King size bed; en-suite bathroom with shower; Private balcony. Twin bedroom with two single beds; en-suite bathroom with shower. Access to balcony. 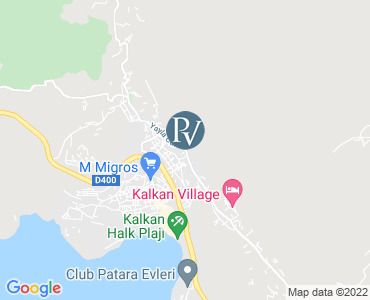 Master Double bedroom with king size bed; en-suite bathroom with shower: access to roof terrace and open air Jacuzzi overlooking Kalkan Bay. All prices are per week for the villa only. Please note that availability shown is subject to confirmation - please call our reservations team.